Our Agile Project Management certification (APMG) seeks to equip individuals with the needed knowledge, skills and attitudes that can make them an expert, responsive and experienced Agile project management worker. Taking the expertise and knowledge specified in the DSDM Atern, we seek to uplift individuals to a high standard of Agile project management expertise. We produce professionals who can apply Agile seamlessly with other high-level project management approaches such as Scrum and others for the complete, responsive, fast-paced, change-filled project management. Our offer consists of a 2-day training at 1.050€ ex VAT to prepare you to pass the Agile Project Management Foundation certification. All our prices contains the the exam, certification, course material, light lunches and the official Agile Project Management® Handbook. All in English. (Training dates see here under). Hands-on experience and support for actual Agile projects, from planning to evaluation phases. Knowledge, skills and attitudes for effective Agile Project Management. Core principles revolving around Agile Project Management to help you immediately understand why this approach is sought-after for the underlying philosophy for business use. Comparison with traditional project management approaches and how Agile is much improved and a great approach especially for IT projects. The tools and requirements for successful Agile project management, to give you great starting points no matter what kind of project you’re working on. No books and notes available during test. All our prices includes the cost of the exam/certification, our pre-course material, course material (handout), lunches and the official Agile Project Management® Handbook. What are the Benefits of our program? The ability to react quickly and appropriately to change. Participants come out of our program with a certification that help them apply relevant project management methods to make a project successfully Agile. 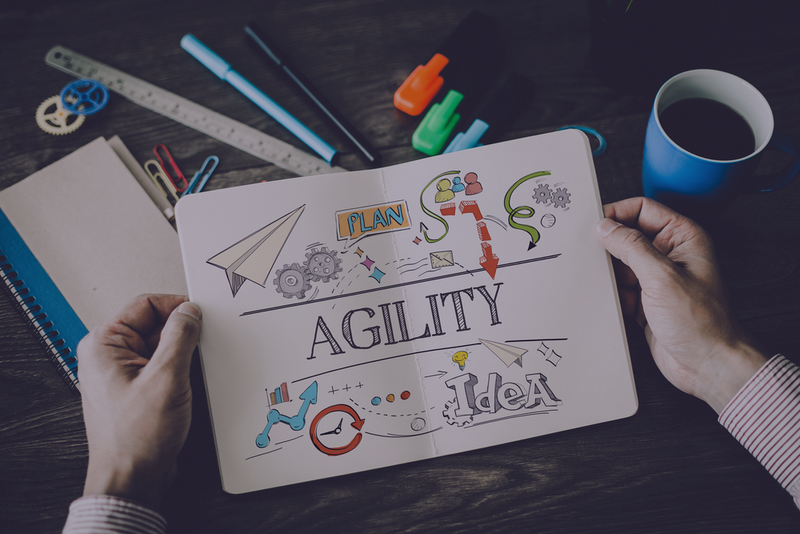 Trainees are equipped with the tools and management styles to be able to customize and tailor the right Agile experience for any project or company. Individuals actively promote trust and close cooperation between the business and developers and give the business on-going visibility into what is happening. Students are able to adapt to the fast-paced and changing business world with Agile methodologies and techniques. Participants are able to deliver projects at more favourable timeframes. Individuals are able to involve and collaborate with stakeholders more effectively and create a truly Agile project. The product owner identifies the product vision. The product vision is a definition of what your product is, how it will support your company or organization’s strategy, and who will use the product. The product owner creates a product roadmap. The product roadmap is a high-level view of the product requirements, with a loose time frame for when you will develop those requirements. The product owner creates a release plan. The release plan identifies a high-level timetable for the release of working software. An agile project will have many releases, with the highest-priority features launching first. The product owner, the master, and the development team plan sprints, also called iterations, and start creating the product within those sprints. Sprint planning sessions take place at the start of each sprint, where the scrum team determines what requirements will be in the upcoming iteration. During each sprint, the development team has daily meetings. In the daily meeting, you spend no more than 15 minutes and discuss what you completed yesterday, what you will work on today, and any roadblocks you have. The team holds a sprint review. In the sprint review, at the end of every sprint, you demonstrate the working product created during the sprint to the product stakeholders. Agile projects deliver increased ROI at shorter time intervals. When change happens faster and at lower cost and lower risk, projects are more likely to succeed beyond the set goals. Lower project costs, risks and issues with the proper risk management. Create more forward momentum and action by constantly validating milestones against business objectives. Agile-trained workers and project managers are able to complement existing corporate processes with faster, more responsive features. Quality checking, audit processes and other business functions are enhanced by Agile, creating transparency and improving company and team track records. Quick solutions through a tried-and-tested Agile approach for immediate turnaround. Work with existing budgets, time scales and scope no matter what stage with this incredibly dynamic project management approach. Increase professionalism, work ethic and work-life balance through structured tasks and intervals that can help workers perform better and produce more. we will provide you with advices and guidances. What is agile transformation ?